The company branding is very good. The name conjures up fit and healthy images, the line drawn moustachioed character is a great ambassador for the brand, but ultimately the bag is a disappointing way of promoting what is a natural and organically focussed, modern company. A firm, not in the slightest bit brittle Chip, that snapped to the crunch and was thick enough to sustain a good chomp. A golden yellow and fairly thick Chip with little in the way of bubbles created by hot oil. Although they were somewhat greasy to the touch they probably had not been fried for as long as many regular Chips. There was some seasoning powder visible, but it was all let down a little by visible grease and seasoning on the interior of the see-through bag. 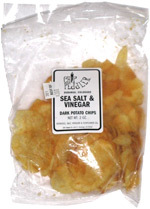 These Potato Chips were a really quite rewarding balance between warm potato, crisp salt and a tart vinegar - which is all that was included apart from the Sunflower Oil they were cooked in. If anything, at first they seemed a little overly vinegary, but closer inspection showed that some had more seasoning than others, which is how it should be.